FOR IMMEDIATE RELEASE: Portland, Maine (May 31, 2018) – Earlier this week, New England Fights (NEF) officials were informed that Mike Crespo had been injured during his fight camp and would be unable to compete at “NEF 34: Home of the Brave” on June 16 in Portland. Crespo had originally been scheduled to face Kam Arnold (3-0) for the vacant NEF MMA Amateur Bantamweight Championship. 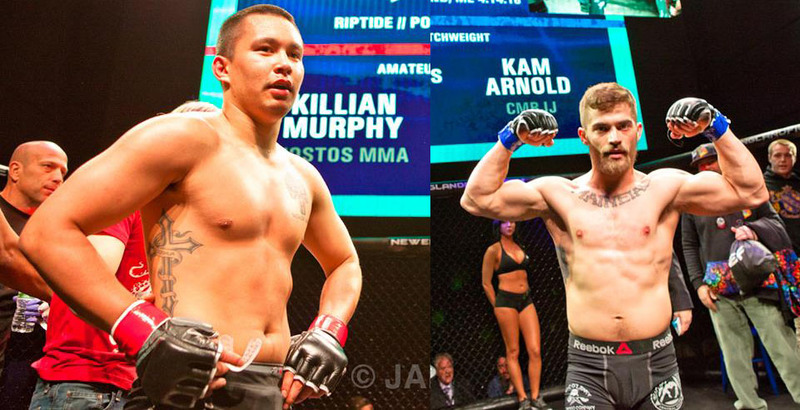 Killian Murphy (1-0) has stepped up to replace Crespo and take on Arnold at Aura for the 135-pound title in a scheduled five-round affair. Murphy made his debut at “NEF 33” last month in Portland with an impressive victory over Krishna Scott (0-1) via first-round technical knockout. He is no stranger to the winner’s circle. Murphy is a former Maine state wrestling champion, having captured a class-A title for Marshwood High School in Elliott in 2015. Today, he trains with Nostos MMA in Somersworth, New Hampshire under the guidance of UFC signee, and former NEF Professional Lightweight Champion, Devin Powell (8-3). Murphy was originally scheduled to compete against Gabriel Diaz of Florida at “NEF 34,” but Diaz pulled out of that fight earlier this month. Perhaps no other member of the NEF roster has had the run in the last twelve months that Kam Arnold has had. He has cut through three opponents in the first round like a hot knife through butter including an eleven-second knockout of veteran David Thompson last month at “NEF 33.” Arnold is a member of Central Maine Brazilian Jiu-Jitsu of Lewiston, Maine.